So this week was a stretch. It was the second busiest week of my school year…the last week of school. Everything is in overdrive leading up to 8th grade Graduation and there are so many balls in the air and a lot of late nights preparing; my days fly by and when I do finally get home, I pretty much collapse and go to sleep. That made trying something new this week tough because not only was I eating simple, but I was in routine mode. Every day same breakfast and lunch and dinner was basic. However, I got home early enough Wednesday night to make dinner and knew that would be my chance. The problem was, I was only in the mood for something light (had a huge lunch out in town to celebrate the graduation) and didn’t have ingredients in the house that were new. This meant coming up with a new recipe using stuff I did have in the house. Of course I ended up with a salad! And here is why this is really a stretch. This salad is nothing new. I mean, it was new to me…but let’s face it, this simple salad is popular on the internet. 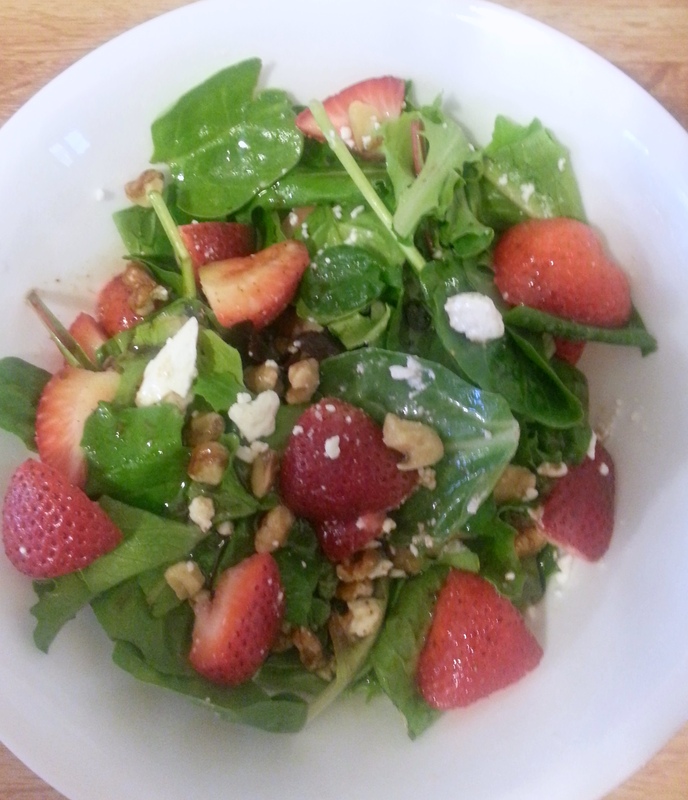 A simple search for “strawberry, feta, walnuts” brought up hundreds of pages. Every one of them had different amount of each ingredient and some included additional ingredients that I either didn’t have on hand or didn’t want to add. On the bright side, many of them included dressings that sound delicious and that I bookmarked to make a later date. For mine, I just used a few tablespoons simple balsamic dressing. This was legit the easiest salad to make. I cut a few too many strawberries, but as far as I am concerned, you can never have too many of those! Again, I really need to work on my food photos because A- all the feta is clearly on the bottom and all the strawberries on top and B- my food photos never show how good something actually looks or tastes! This salad was delicious! It was super quick to put together, the flavors went perfectly with one another and it is so healthy; high in protein and fiber and the walnuts are a very healthy fat. It will probably be a summer staple for me! Please Note: Nutritional information estimated based on brands I use and/or calculations using nutriondata.com and sparkpeople.com. Data may not be completely accurate and yours may differ. You should not refer to this data as being exact but as a figure. I do not take responsibility for the inadequacies of the nutrition calculator used. This data is provided for general reference only. Posted on June 6, 2014, in Food, New Food Friday, Recipes. Bookmark the permalink. 4 Comments. I love Iceberg lettuce. I would never have thought of using strawberries in a salad. Thanks for the tip! oh yummm!! fet + fruit + nuts is always a good combo! I’m trying to get into kale salads right now! Yummy! Love me some spinach salad with fruit! I threw chicken over some greens the other day with pecans and fruit. Totally delish. That’s one of my favorite salads! I often use goat cheese instead of feta though. I usually don’t make (or buy) a real dressing though and just use olive oil and balsamic vinegar.